'And in praying use not vain repetitions, as the Gentiles do: for they think that they shall be heard for their much speaking. Be not therefore like unto them: for your Father knoweth what things ye have need of, before ye ask Him.' - Matt. 6:7-8. A BISHOP was sailing from Archangel to the Solovétsk Monastery; and on the same vessel were a number of pilgrims on their way to visit the shrines at that place. The voyage was a smooth one. The wind favourable, and the weather fair. The pilgrims lay on deck, eating, or sat in groups talking to one another. The Bishop, too, came on deck, and as he was pacing up and down, he noticed a group of men standing near the prow and listening to a fisherman who was pointing to the sea and telling them something. The Bishop stopped, and looked in the direction in which the man was pointing. He could see nothing however, but the sea glistening in the sunshine. He drew nearer to listen, but when the man saw him, he took off his cap and was silent. The rest of the people also took off their caps, and bowed. 'The fisherman was telling us about the hermits,' replied one, a tradesman, rather bolder than the rest. 'And what are they like?' asked the Bishop. 'And did they speak to you?' asked the Bishop. 'There, now you can see it plainly, if your Grace will please to look,' said the tradesman, pointing with his hand. There was no help for it; so the order was given. The sailors trimmed the sails, the steersman put up the helm, and the ship's course was set for the island. A chair was placed at the prow for the Bishop, and he sat there, looking ahead. The passengers all collected at the prow, and gazed at the island. Those who had the sharpest eyes could presently make out the rocks on it, and then a mud hut was seen. At last one man saw the hermits themselves. The captain brought a telescope and, after looking through it, handed it to the Bishop. The cable was quickly let out, the anchor cast, and the sails furled. There was a jerk, and the vessel shook. Then a boat having been lowered, the oarsmen jumped in, and the Bishop descended the ladder and took his seat. The men pulled at their oars, and the boat moved rapidly towards the island. 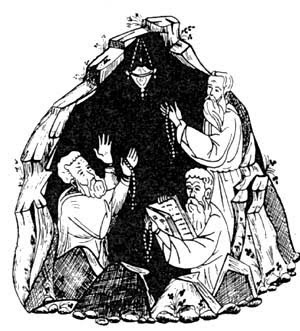 When they came within a stone's throw they saw three old men: a tall one with only a mat tied round his waist: a shorter one in a tattered peasant coat, and a very old one bent with age and wearing an old cassock -- all three standing hand in hand. 'But how do you pray to God?' asked the Bishop. 'Which art in heaven,' continued the Bishop. The first hermit repeated, 'Which art in heaven,' but the second blundered over the words, and the tall hermit could not say them properly. His hair had grown over his mouth so that he could not speak plainly. The very old hermit, having no teeth, also mumbled indistinctly. The Bishop did not leave off till he had taught them the whole of the Lord's prayer so that they could not only repeat it after him, but could say it by themselves. The middle one was the first to know it, and to repeat the whole of it alone. The Bishop made him say it again and again, and at last the others could say it too. 'Look there, what is that, my friend? What is it?' the Bishop repeated, though he could now see plainly what it was -- the three hermits running upon the water, all gleaming white, their grey beards shining, and approaching the ship as quickly as though it were not morning.